Did your dog just eat chocolate or mouse poison? Looking for some great free pet poisoning advice? Not sure what human medications or products in the house, yard, or garden are dangerous to your dog or cat? Here, my review of this recently released top pet app to have! Whether you’re a dog or cat owner or veterinary professional, this free one should be on your Top 10 apps to have. This free app is designed for pet owners AND veterinary professionals to be able to quickly identify what’s poisonous to their pet or patient. It includes common household products (like household cleaners, batteries, etc. ), yard and garden dangers (e.g., bone meal, fertilizer, etc. ), human medications (both prescription and over-the-counter), and plants. While the app is more oriented for pet owners, it’s still a great app for veterinarians, veterinary technicians, and veterinary students, as it has the ability to calculate toxic doses of chocolate and mouse and rat poisons (e.g., rodenticides). 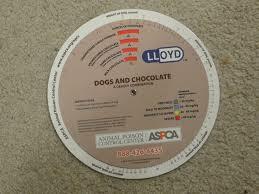 It’s combined the chocolate wheel and rodenticide chart into this free app so you can literally calculate from your smartphone! Download this ASPCA APCC app for FREE at the links below. Don’t forget to write a review (remember, it’s free, so they should get an automatic shout-out for that, as other animal poison apps charge for this!) after you check it out! HINT: To access the chocolate calculator, simply search under chocolate. For the rodenticides, search under the active ingredients: brodifacoum, bromadiolone, diphacinone, chlorophacinone, difethialone, and warfarin. Great app for my smart phone…easy access for in clinic use…love it! Nice app. Would be nice if it gave generic names of substances as well, seeing as many people do not know most substances by their brand name. Also, needs to say what exactly constitutes a moderate or severe reaction. All in all though, nice app for the general public. And, xylitol is toxic to cats as well, not just dogs. But doesn’t pop up in the cat section. Thanks Catie! It’s not known if xylitol is poisonous in cats! ASPCA APCC hasn’t seen this yet, as cats are too smart to chew gum! I agree! I think adding common names to the search function would be a wonderful idea. I feel that many clients may not search for active ingredients, but use terms like “rat poison” instead. Great app! Thanks for the share. The photos will be useful for IDing some substances with owners. Looking fwd to using this! this is great app. I have 2 dogs and it will be so nice to have this information at my fingertips. I thank you and my dogs thank you. Thank you! Just asked to install it at every device in our small animal practice. Tried to download in the app store. It says: not available in the USA. So people have to call the ASPCA and pay $65 dollars. But elsewhere in the world you can download the app for free???????? My dog just ate two or three pounds of frozen cooked chicken wings. should I be concerned? Yes. I would get to your vet asap.